There are many ways to have some Brooklyn-style Easter fun with the kids, from hunting for eggs and having pictures taken with the Easter Bunny to playing games in parks across the city. 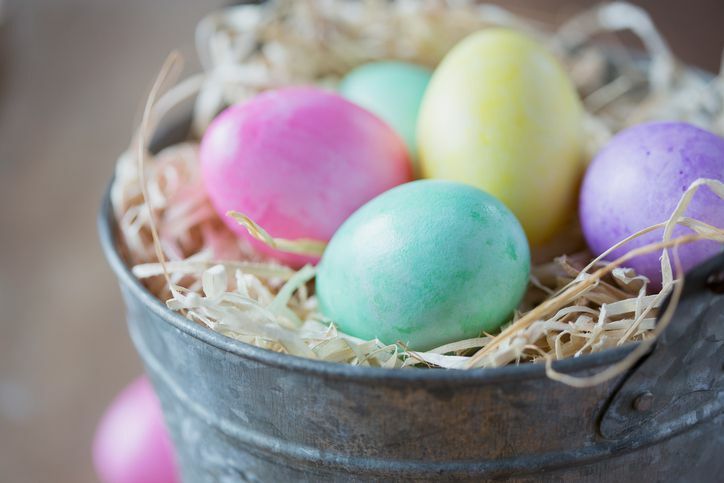 Whether you live in Williamsburg or Dyker Heights, this Easter season is full of exciting family-friendly events you and your children can attend—just remember to sign up in advance as many of these popular celebrations fill up fast in Brooklyn, New York. Each year, the Aviator Sports and Events Center in Brooklyn hosts an Easter egg hunt in Fort Bennett Park where families are invited to spend the day hunting colorful eggs and meeting the company's version of the Easter Bunny, Whiskers. In addition to meeting the famed bunny and having your picture taken with him, there will be cupcake decorating and other kid-friendly activities on-site. Easter at Aviator Sports is a highly-popular event and requires advanced registration to participate; be sure to sign up for a spot for your kids at least two weeks before Easter so you don't miss out on this exciting opportunity. Boulevard Books and Café in Dyker Heights (7518 13th Avenue) will host a special event this Easter celebrating both the holiday and the joy of reading. During the event, you can join bookstore employees and families as they read Easter-themed stories with the Easter Bunny and participate in a variety of holiday crafting activities. After, each child will color their own Easter-themed egg basket or bag and be invited to hunt for tons of candy-filled eggs before settling down on the lap of the Easter Bunny for do-it-yourself photos. In order to attend this annual celebration, you must RSVP on the Facebook event page. After all of the available attendance slots are filled, a waitlist will be created by Boulevard Books to try to accommodate any extra guests who may want to attend, but the event typically fills up at least two weeks before Easter each year. Kaiser Park on Neptune Avenue and West 27th Street in Coney Island will host its annual Easter egg hunt over the holiday weekend each year. During the festivities, kids can pick up as many colorful eggs as they can in an allotted period of time, and prizes will be awarded to kids in each age bracket that collect the most goodies. Guests are encouraged to bring their own holiday baskets, though a few local vendors may be on-site selling cheap ones. In addition to the egg hunt, the Kaiser Park Easter celebration will also feature visits from the Easter Bunny as well as one of the mascot characters from the Brooklyn Cyclones team. Advanced reservations are not required to attend this free event, but only kids aged 3 to 14 years old are welcome to participate in the egg hunt. Each year, the Brooklyn Children’s Museum​ (145 Brooklyn Avenue) at St. Mark's and Brooklyn avenues in Crown Height hosts a two-day celebration in honor of the Easter holiday. Although it's not an Easter egg hunt, the lineup of special workshops and interactive tours offers plenty of opportunities for your kids to learn about traditions surrounding Easter through a variety of hands-on activities. Events and activities for this year's Spring Egg Party include an egg basket decorating workshop, block play at the Brooklyn Block Lab and Studio, a touch tank full of live sea creatures, an egg scavenger hunt through the exhibits, and a tasting event featuring traditional Passover foods like Matzah and Maror. Additionally, the adorable hands-on program called Egg-citing Eggs for the 5-and-under crowd invites smaller children to create their own deliciously gooey sticky Easter egg with papier-mache. The largest climbing and bouldering gym in New York City, Brooklyn Boulders in Gowanus (575 Degraw Street) and Queensbridge (23-10 41st Avenue, Queens), will host a unique Easter egg hunt this year. During "Eggstravaganza," family-friendly Brooklyn Boulders will be divided into interesting rooms and spaces where kids can hunt to their hearts' content during this event. All guests are required to sign a waiver to participate and must RSVP to the event online. A small fee is charged per child and space is extremely limited, so be sure to book your reservation for this year's event today. The local community nonprofit organization Town Square hosts a variety of special events throughout the year, but the annual Spring Egg Hunt is perhaps one of their most popular celebrations of the spring. As many as 3,000 eggs might be hidden around fourfivesix, a venue in Williamsburg and Greenpoint on the corner of Humboldt Street and 199 Richardson Street (199 Richardson), where the event will take place in 2019. Guests will need to bring a basket and are encouraged to bring their own cameras to capture the magic of the day's festivities. However, there will be a spring photo booth, visits from the Easter Bunny, and a variety of arts and craft-making workshops for all ages as well; there will also be a separate play area for babies and toddlers during the merry madness of the hunt. Although advanced registration is not required, you must purchase a ticket for your child to participate and prices for tickets increase at the door. If you're looking for an egg hunt with a view this holiday season, you can head to the Pierrepont Playground on the Brooklyn Heights Promenade for an exciting hunt set against the backdrop of the Manhattan skyline this year. However, buttoned-up Brooklyn Heights is punctual even about its Easter egg hunts, so you'll need to get there early to make sure you are there for the start of a wild kiddie egg hunt. During the event, you can also browse goods at a bake sale, meet local families, and enjoy the fabulous view of Manhattan—all for free. For an extra-sweet treat this Easter, you can take your kids to Li-Lac Chocolates in Industry City for its annual factory egg hunt this April, but if you can't make this annual event, you should try to visit the factory and pick up a chocolate Easter bunny anyway because they are some of the best you can find in the city. To attend the egg hunt, be sure to stop by Li-Lac Chocolates over the Easter holiday weekend and sign up for a spot. Li-Lac Chocolates has five locations in New York City, but the only location in Brooklyn is inside the Industry City business development area at 68 35th Street (between Second and Third Avenues) in Greenwood Heights. Although the long-time Republican State Senator Marty Golden from Bay Ridge lost his re-election bid in 2018 to a Democratic challenger, the popular community events Golden once hosted are scheduled to continue under Democratic State Representative Andrew Goundardes. One of Golden's most popular events, the Golden's Annual Easter Egg Hunt, will be one of the first such events Goundardes will host in 2019 in both Marine Park and Bay Ridge. Be sure to check the new state senator's official Senate calendar for more information on attending this exciting event. With over a dozen different parks to choose from, there's no shortage of green space in Brooklyn where you and your kids can make your own do-it-yourself Easter egg hunts this year. You can independently head to Prospect Park, Fort Greene Park, Owl's Head Park, or any other Brooklyn Park with your children to make your own fun. Additionally, many smaller community organizers will be hosting their own egg hunts, so be sure to check local papers and neighborhood publications for a more extensive list of upcoming Easter celebrations.